Irrican (Irrigation Canal Co-operative Ltd.), according to Taber Irrigation District (TID) District Manager Chris Gallagher, is a separate for-profit company that owns, operates and maintains three hydroelectric facilities associated with the common carrier reach of the St. Mary River Irrigation District (SMRID) main canal. TID, Gallagher explained, is a 15 per cent partner in Irrican, together with SMRID at 75 per cent and RID (Raymond Irrigation District) at 10 per cent. “Neither TID, SMRID or RID own hydrogeneration facilities individually,” said Gallagher. Gallagher said the Raymond power plant, located southeast of the Milk River Ridge Reservoir, has a capacity of 20 MW. “The Drops 4, 5, 6 power plant, located northeast of Raymond, has a capacity of 7 MW. The Raymond and Chin plants started generating power in 1994, with the Drops 4, 5, 6 plant coming online in 2004.” The Chin power plant, located southeast of Coaldale, has a capacity of 11 MW. According to Gallagher, the electricity generated from these plants is sold to the balancing pool administered by the Alberta Electric System Operator (AESO). The green attributes are sold as Renewable Energy Credits (RECs) to volume buyers. Gallagher added he acts as the assistant manager of Irrican and looks after administration of the green attributes. An irrigation district is a corporation that operates under the authority of the Alberta Irrigation Districts Act — whose primary purpose is to convey and deliver water through irrigation works, divert and use quantities of water within the terms of its licence, and to construct, operate and maintain irrigation works. There are thirteen irrigation districts in Alberta providing water to approximately 1,435,669 assessed acres of land. Infrastructure, that provides water to the irrigation districts, is comprised of approximately 7,943 kilometres of conveyance system — of which, 339 kilometres are owned and operated by Alberta Environment and Parks. According to Irrican literature, the Raymond Reservoir Hydroelectric Project — located on the SMRID Main Canal at the Raymond Reservoir went online in 1994 at a total cost of $26,800,000. 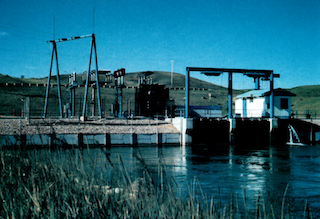 The Chin Chute Hydroelectric Project — located on the SMRID Main Canal at the Chin Reservoir also went online in 1994 at a total cost of $17,600,000.